Searching for grease guns but don’t know which one to buy? Well, that should not worry you too much. With us, you are assured of getting the ideal model that will offer proper lubrication and help prolong the life of your equipment. There is a myriad of options when it comes to selecting the best in grease guns. But time is not something that we have in plenty. That is why we have decided to narrow down your search to the best models from which you will definitely derive great satisfaction. 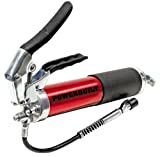 This is a lightweight pistol-style grease gun. It is ergonomically designed to provide a comfortable grip. The barrel is made of 18 gauge steel to guarantee maximum durability. The handle features a chrome finish that makes it resistant to corrosion. This gun generates 10,000 PSI. It has a discharge rate of 4 ounces per 100 strokes. It comes with an 18-inch flexible hose for extended use. Lincoln Lubrication joins the list with its one-hand operation grease gun. The gun is made of cast aluminium to give it a desired level of strength and durability. The pumping action makes use of an advanced lever mechanism. The gun features a follower spring that provides a smooth pumping operation. The gun has a discharge rate of 1 ounce per 33 strokes. It features an 18-inch hose that provides a flexible and extended reach. DEWALT is known for its high-performance power tools. 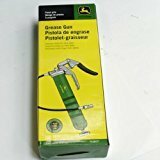 This 20-volt grease gun is no exception. The gun is ergonomically designed to provide exceptional comfort. The handle is perfectly moulded and centred on providing great balance and control. The automatic pumping operation is achieved by a powerful motor. The motor generates a maximum pressure of 10,000 PSI. It has an output of 5 ounces per minute. The gun incorporates a LED light to allow for night operations. It comes with a 42-inch high-pressure hose. 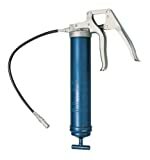 This is an automatic air-operated grease gun. Its advanced pumping mechanism delivers smooth and continuous flow. Its variable speed trigger gives you total control over the flow. The air pressure of the gun ranges from 40-150 PSI. The gun generates up to 6,000 PSI. It comes with a 30-inch hose and coupler for mess-free application. 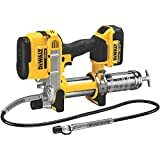 This is yet another grease gun from DEWALT. It is powered by an 18-volt battery that drives its high-performance motor. The motor features a customizable speed that gives you full control over the flow. At maximum speed, it generates 9,000 PSI and a flow rate of 5 ounces per minutes. The handle is ergonomically designed and conveniently positioned. This allows the gun to balance well in your hand. The gun comes with an extra-long 42-inch hose. It features a LED light that allows easy operation in dark areas. Simple as it may look, Lumax LX-1185 actually packs a great punch in its small and lightweight design. This suction gun is designed for filling and draining applications. It features a durable barrel made of heavy-gauge steel. The barrel has a fluid capacity of 18 ounces. The suction mechanism is achieved by a 10-inch stroke. The gun comes with a 12-inch flexible hose for hassle-free operation. It is meant to be used with lubricants that are non-corrosive. This grease gun is built to last, thanks to its die-cast aluminium construction. It features a pistol-style handle that provides a firm and comfortable grip. Its large diameter piston is driven by a plunger mechanism. The gun delivers a maximum pressure of 7,500 PSI. It has an automatic bleeder that serves to relieve pressure. The gun comes with a 24-inch hose and a coupler for convenient application. 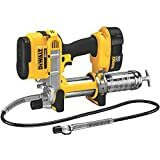 This is a heavy duty grease gun that incorporates a pistol-style grip. It features a durable canister made of anodized aluminium. The gun utilizes a standard 14-ounce cartridge. It generates a maximum pressure of 4,500 PSI. The handle is rubberized and perfectly contoured to provide excellent grip. The gun comes with a 12-inch flexible hose and 5.5-inch coupler for mess-free and easy application of oil. John Deere is one brand that sets the bar high when it comes to farm tools and equipment. This grease gun stands true to the company’s reputation. It is made of high strength material to give it unrivalled durability. And when it comes to comfort, it does not disappoint as it offers you with a pistol-style grip for easy and effortless operation. Despite its small size, this gun delivers an incredible 6,000 PSI pressure. As the name implies, this gun is designed to generate great amounts of pressure. The gun features a powerful motor that derives power from 12-volt rechargeable batteries. Compared to the traditional manual grease guns, it is designed to be 50-percent more efficient. The gun utilizes a standard 14.5-ounce cartridge. It generates up to 8,000 PSI. It comes with a case for convenient storage and transportation.